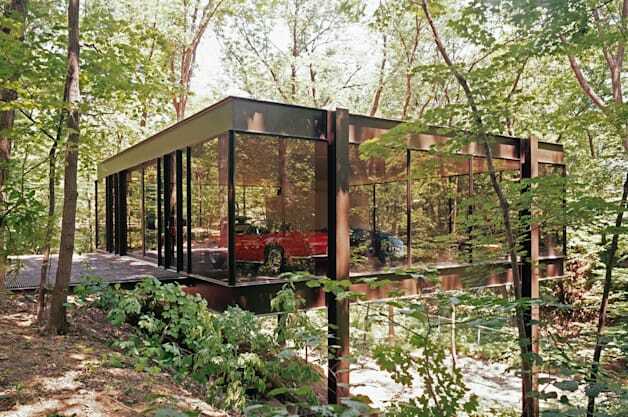 Cameron's iconic house from Ferris Bueller's Day Off is for sale. Again. We can't fathom why somebody didn't swoop up this famous house in Highland Park, Illinois, when it was first offered for sale in 2009, and again in 2011 – especially considering its role in the hit 1986 film Ferris Bueller's Day Off. But if shoppers were holding off due to the price, it's time for them to take another look: since 2009, the home on 370 Beech St. has dropped from $2.3 million to $1.65 million, and now, to $1.5 million. The Chicago-area home, which was Ferris Bueller's friend Cameron Frye's house in the movie, has four bedrooms, glass walls, and was built by notable architect A. James Speyer in 1953. The detached garage, an add-on built in the 1970s where the owner stored his classic cars, is also where Cameron sent his dad's 1961 Ferrari 250 GT California Spyder plummeting to its death into the ravine behind it. (Don't worry, the car was actually a replica made with MG underpinnings - not one of the 55 examples ever made). Now, with that price reduction, perhaps the future owner will have a bit of money left over to rehab the kitchenstage a reenactment of the famous scene - with a Ferrari replica, of course.